Rosa pimpinellifolia aka. the Burnet rose. One of the first roses to come out each year and what a ray of sunshine these blooms create when they appear. Such a delicate looking rose bloom but don’t be fooled. This is not a rose for the faint-hearted. R. piminellifola is very thorny and suckers wildly. A firm hand is required to keep her where you want her to be. 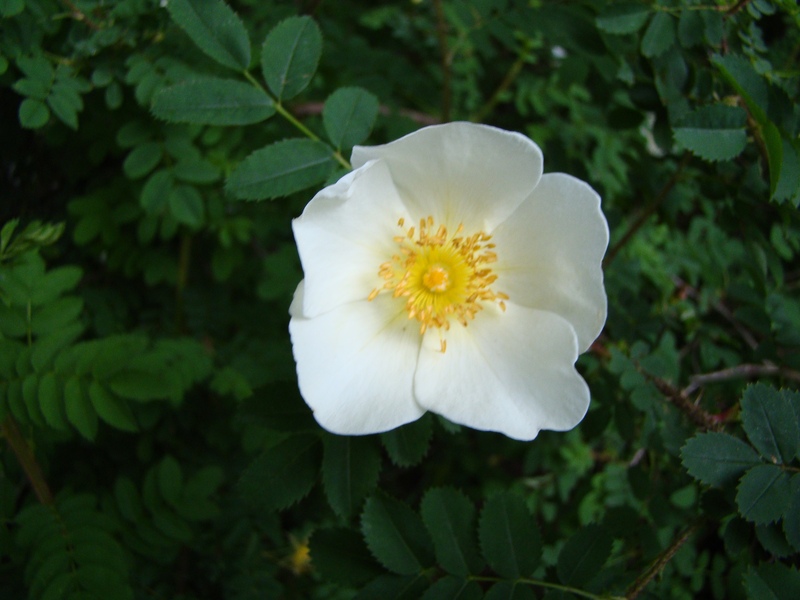 Planted in part shade in sandy, rocky soil, this rose thrives. Would be very suitable for a wild garden. or a sandy location near the ocean. This is a once bloomer so after a month of bloom, I just whack her back and ignore her till the following year. This entry was posted in The Garden and tagged Coastal BC, cottage garden, garden, langley, Metro Vancouver, roses by topdrawerdecor. Bookmark the permalink.